Disclosure: This is a sponsored post. I was compensated for sharing about Dress First with all of you, but all opinions are 100% mine. Over the last five years, my husband and I have been to a LOT of weddings. Each year we get at least one wedding invitation; one year we got up to five or six. In many cases, these weddings have many of the same guests and many of the same group photos. Then, consider all the weddings one or both of us have stood up in and all the engagement parties, wedding showers and rehearsal dinners that go along with that honor. Add all of that up, and I have needed a lot of dresses over the years. AND those dresses have usually needed at least a little altering because my body doesn’t match the dress on the rack. 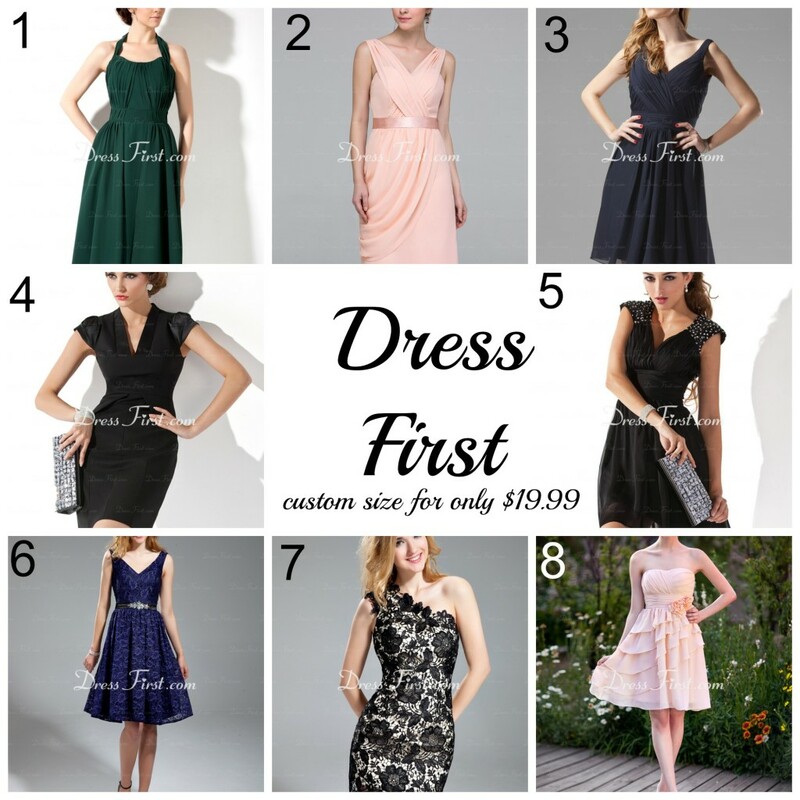 What I love about Dress First is that you can enter your measurements and have a custom size made for you right from the beginning for only $20. I think it is so amazing for Dress First to offer this service right from their site! It means that you don’t have to wait for your dress to see how it fits and then take it to a seamstress. It will be made to fit you! Plus, $20 is a very reasonable price for custom fitting while also saving extra steps and time. Whether you are a guest or looking for your bridesmaids, this service can be helpful. Dress First has a wide selection of dress, from traditional wedding dresses to bridesmaid dresses to prom dresses. I also love that it has a category for little black dresses (who doesn’t need one of those?!) and wedding guest dresses. We have at least one wedding for sure this year, so I thought I would browse the selection offered at Dress First to get some ideas. Below you will find some of the dresses that have definitely made my maybe list for this wedding season!